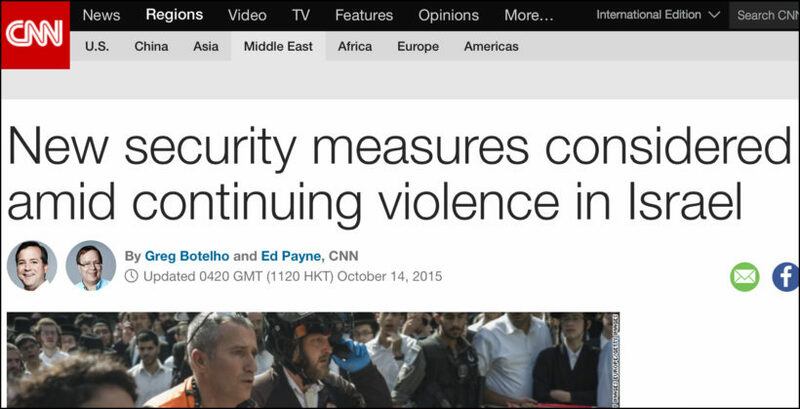 “When, and how, will the violence stop?” begins CNN a lengthy article on October 13 about “more bloodshed” which dismally fails to identify the Palestinian perpetrators of said violence and bloodshed (“New security measures considered amid continuing violence in Israel“). Of course, violence is hardly unprecedented in this part of the world. But the nature of what has happened in recent weeks — with a spate of stabbings and other attacks, from a shooting to driving into crowds — is unique, compared to rocket attacks or more obviously orchestrated armed campaigns of the past. Who is carrying out the stabbings, shooting and ramming attacks? Who has carried out the rocket attacks and the more obviously orchestrated armed campaigns? Who has been targeted, wounded and killed in the spate of attacks? CNN doesn’t say, and readers have therefore no way of grasping “the nature of what has happened in recent weeks”: that Palestinians, primarily youth, have been attempting to murder Israelis, young and old. Botelho and Payne continue to dance around the question of who is carrying out the attacks by stating three paragraphs later: “Some have suggested the violence represents the start of the third intifada, or uprising, by Palestinians.” From there, the CNN journalists redirect to Palestinian clashes with Israeli security forces, leaving aside the unaddressed issue of culpability in the stabbing, ramming and shooting attacks on Israeli civilians and officers. This youth was apparently referring to persistent protests and clashes with Israeli security forces. On what basis exactly they conclude that the youth’s declaration of the Palestinian readiness to fight refers to clashes with security forces, as opposed to stabbings, shootings and ramming attacks, is not explained. But, in light of the reporters’ refusal to link Palestinians with these attacks, their tenuous conclusion is not surprising. Israeli authorities documented several bloody attacks, including one in which an Israeli Jew stabbed a man he mistakenly thought was Arab outside an IKEA near Haifa; and an Israeli Arab hit on the head with a stick on a Netanya beach, according to police spokeswoman Luba Samri. Other incidents proved even more bloody and were carried out by men that Israeli authorities claim have ties to terrorist groups. In Jerusalem’s ultra-Orthodox Malkei Israel area, one person died and eight were injured when a man drove into a bus stop, ran over three people, then got out of his car and began stabbing people, according to Samri. And in the Armon Anatziv [sic] area of Jerusalem, one person with a gun and another with a knife boarded a bus and launched an attack. . . . In a second equally egregious double standard, the intrepid pair supplies the identity of the Arab wounded while at the same time consistently concealing the identity of the Jewish wounded. Thus, a “man [mistaken for] Arab,” was stabbed and an “Israeli Arab [was] hit on the head,” but “one person died and eight were injured,” “three people” were run over and “people” were stabbed in the Malkei Israel attack. In the Armon Hanatziv attack, “two passengers had died.” Botelho and Payne don’t bother to note the wounded in the Armon Hanatziv attack, but there were some 15 of them. The official Palestinian news agency, WAFA, reported that “live ammunition” wounded at least five Palestinians at the Beit Hanoun crossing point Tuesday. This is after the 18 reportedly shot and injured the previous night at the Hewwara military checkpoint. The Palestinian Red Crescent reported that at least 155 people needed medical care — most for tear gas inhalation, though 26 were wounded by rubber bullets, six by live bullets and five reportedly beaten — in the West Bank and Jerusalem. Thirty-seven more were injured in Gaza. Finally, while the article identified the Israeli Jews wounded on Malkei Israel street in the ramming and stabbing attack only as “people,” the Palestinian casualties from clashes are clearly identified as “Palestinian” in the first reference. In short, the CNN article which ostensibly (supposedly) sets out to answer “when, and how, will the violence stop,” fails miserably to begin to address the more basic question: who is carrying out the violence against whom? What three types of bias are illustrated in the report on CNN above? Bias by omission, labeling and spin.